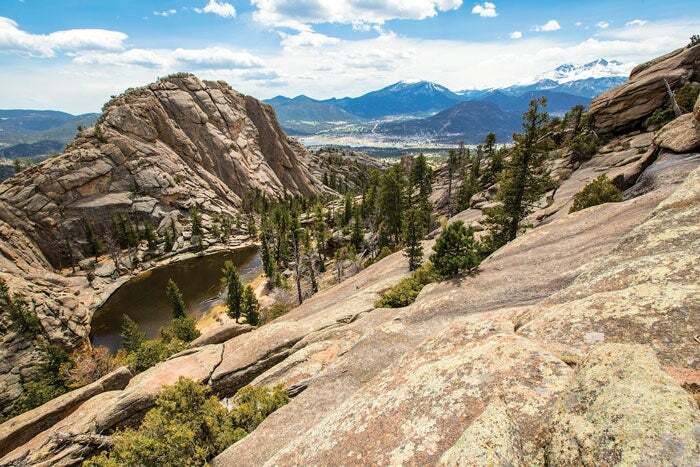 Perched at 7,200 feet and 90 miles away from Denver, Estes Park is a fantastic basecamp for exploring Rocky Mountain National Park’s eastern side. You also can access the park&apos;s west side via the park&apos;s spectacular Trail Ridge Road, which connects the two sides of the park. Take a stroll down its lively downtown lined with coffee shops, restaurants and boutiques. Or sit on a bench along the Riverwalk, which spans the downtown area from the Estes Park Visitor Center to Performance Park on the west end of Elkhorn Avenue. Along the way, stop in photographer Erik Stensland&apos;s landscape photography gallery, Images of Rocky Mountain National Park, at 203 Park Lane downtown to see the park in a new light. Afterwards, check off one of these bucket list activities. As you explore Estes Park, it&apos;s hard to miss the iconic Stanley Hotel sitting slightly above town. The white palatial hotel opened in 1909 and was built by inventor F. O. Stanley who produced steam cars Author Stephen King’s overnight stay here inspired his best-selling book The Shining. Take a ghost tour, then in the evening, have a drink at the Whiskey Bar, which has Colorado’s largest selection of whiskey. You may even spot the ghost of Stanley checking in on his establishment. Cabins at the YMCA of the Rockies in Estes Park Colorado. Set in a forested compound overlooking Estes Park, the YMCA of the Rockies is a family-oriented camp with rustic wooden lodges and dining halls straight out of a national park postcard. The camp offers numerous activities, including crafts, mini golf, horseback riding, and ziplining. Iconic Longs Peak overlooking horseback riders on the edge of Estes Park. There’s nothing more quintessentially Western than jumping in the saddle for a ride. Several outfitters run guided trips into the park and the surrounding Roosevelt National Forest. For a peaceful mountain retreat, head to Dao House, which offers lodge rooms, standalone suites and wellness programs in a beautiful forest setting. Dao House offers holistic treatments like massage and herbal aromatherapy, as well as classic western ranch activities like rides on a horse-drawn carriage, wagon or sleigh, one of which brings you to an outdoor campsite for a cowboy dinner. Is the altitude giving you a headache? Head to the Oxygen Lodge where you can pay to breathe in 90 percent pure oxygen infused with energizing aromatherapy blends. Choose between a 30-minute or 45-minute treatment. Get outstanding views of Longs Peak, Rocky Mountain National Park and the Continental Divide when you ride the Estes Park tram. You&apos;ll start at 420 East Riverside Dr in Estes Park and then ride all the way up to the top of Prospect Mountain. The tram is open late May through early September. No reservations are required. For the best photo opportunities and to avoid possible thunderstorms, go early in the morning.